That's it. "Good to the last drop." Thanks Duff. Bob, it was Maxwell House. Watch the commercial here. 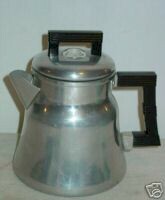 Who remembers the TV coffee commercial that was based on the sound a percolator made? Was it Maxwell House? Savarin? You know you're getting older whenyou start making noises like your percolator. We had one of these, but we only used it for "fancy occasions", like for family Thanksgiving parties and things. Otherwise we always used instant. I used to love the smell of percolating coffee and always dug how the coffee would pop up and down in the little glass as it was percolating. Alas, these are gone now. My parents always had a "Drip-O-Lator" for some reason. I've never figured out what the dfference was, but it had something to do with how the coffees, in the cans, were ground, and how the insides of the brewing containers were configured. We had one of them!